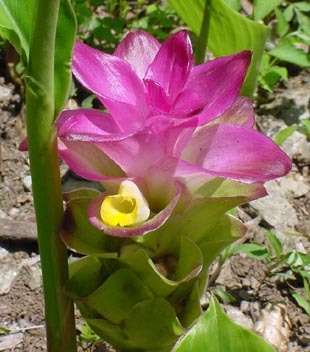 Siam Natural Wan Nang Kham (curcuma aromatica) herbal powder compound spa massage health treatment from Thailand . . . This native herb has a long history as a remedy dating back to ancient times. In holistic & Ayurvedic medicine, Wan Nang Kham has been prescribed for poor vision, rheumatic complaints, and to increase breast milk production. Because it aids in the digestion of proteins and the absorption of nutrients, as well as stimulating the flow of bile, Wan Nang Kham with it's high content of curcumin is used as a treatment for certain stomach ailments, diarrhea, and flatulence. Department of Studies in Applied Botany and Biotechnology,University of Mysore, Manasagangotri, Mysore-570 006. India.